...above a hawk glides on air currents only he can see and feel. Somewhere on the bank an unknown insect is calling out to be noticed. Slowly, a tiny drip runs down the side of the teal colored glass of sweet tea, the slice of lemon sits like the sun on the rim. 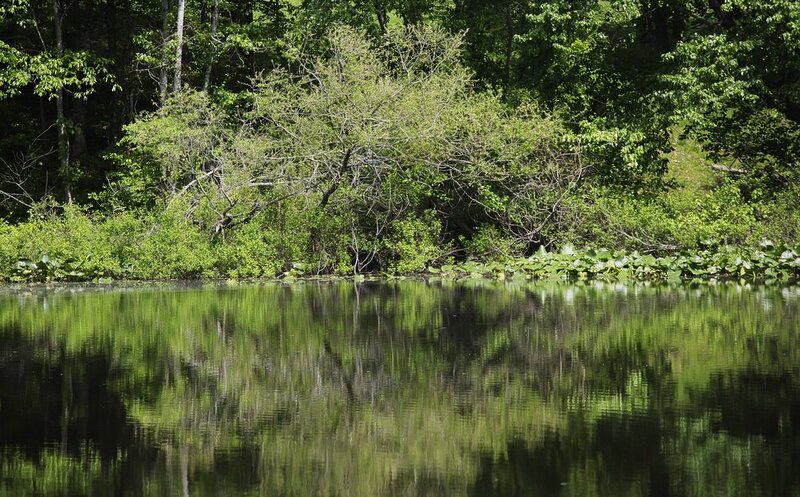 The pond is a mirror, hard to tell where land and water meet only the sliver of clear blue sky shows the dividing line between foliage on land and the reflection it leaves on the water. Monet would be home here. If you are still, if you listen tight, in the background drifting softly you can almost hear the pounding of the typewriter keys, the ghost of William Faulkner lives in the morning pond mist. It is old school South, charm, manners, tradition and values. David & Sharon Seaton talk not of how they fish, but why they fish. The why brings about tales of "Daddy," of "Granddaddy." The why brings about the story of "them" and how a fishing date, a first time ever fishing for Sharon, lead to over 50 years of marriage. To those who have one on their property, or frequent a nearby one, a small pond becomes a family member, a trusted source, a good buddy. It is in fact the original Nature Channel, pull up a lawn chair and a cooler and it's entertainment and education 24 hours a day. Thoreau knew, it's why he didn't write "On Walden Boulevard." There is something magical about a pond even though it is the same pond everyday it also manages to be a different pond every day, sit there and watch it changes minute by minute. It's the original serial channel surfer. Welcome to Springville, Tennessee and David & Sharon Seaton's pond. They live on several wooded acres, built their house, a cabin and artist studio all centered around the pond that was here waiting for them. The pond is about 12 feet deep at the deep end and no feet deep in the shallow end. About a 5th of it is covered in lily pads, trees frame the bowl, gentle waves let you know what is pond and what is sky, on a clear no breeze day the only way you know which is which is to toss a stone into the blue mirror. Crickets cricketing, frogs bellowing, hawk wings flapping above, the symphony of this pond. Meet David Seaton, he's made a thousand casts into this pond, many directed at the same lily pad where a "bigun" tends to hang out. Here in David's words comes the story of WHY he fishes, and the memories of those who first put a fishing rod and reel into his young hands and said simply this, "Let's go fishin'." 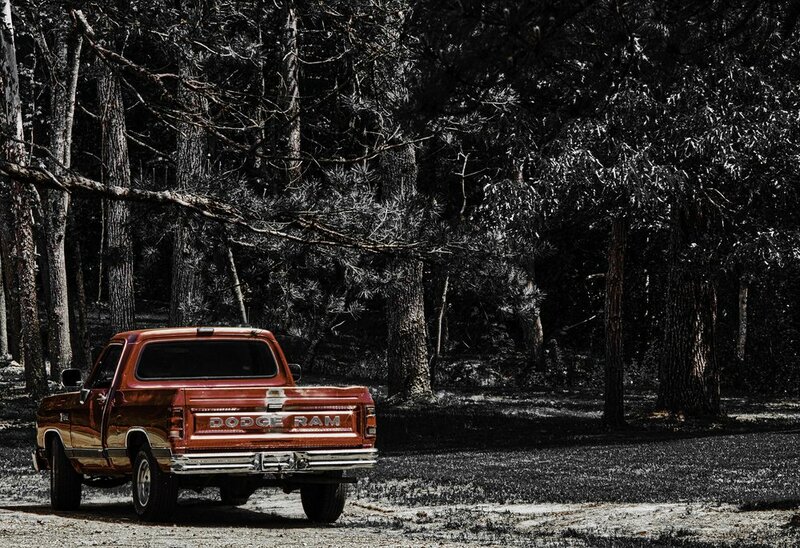 "First went fishing with my granddaddy, he didn't drive but he had this car, I was 7 or 8 years old, he let me drive that car for him and would fetch me and say lets go fishing and we would drive down to the lake and he would lay out some trout lines. It was a thrill for me as a kid, I'd get all excited and looking forward to it, my grandaddy, I called him "pappa," he was a rough guy, spent some time in prison he did, but around me, he was gentle, so gentle with me and patient, as a kid I would be asking him all these questions, ask about fishing, ask about other things, and you know what I remember most was he never shortchanged me, always took the time to explain what he was doing, how he was doing it and why he was doing it, always when we were together he gave me his time." David's father "was a workaholic, he served in World War Two, came home and used the GI Bill to go to school to be a mechanic, didn't like that and became a carpenter, in time owned his own business. Daddy was unlike his daddy in that he was a pious man, very religious, never swore, went to church on Sunday, believed strongly in the lord, we fished maybe 3 or 4 times together. He was a busy man and time was meant for taking care of the family needs but ever once in awhile we would go fishing, we'd go rent a boat, $2.50 a day for a flat bottom wooden paddle boat, $3.50 a day for one with one of those rope pull start motors, and we'd go off. It was never really about fishing, it was about being out in nature, teaching me and telling me things about it, it's where my love for nature started, wasn't so much about catching fish as it was just catching a few hours to spend with me." We are sitting on David's porch overlooking his pond, he points to a chair where "my mamma used to sit there for hours fishing that pond, she had health issues you know, was elderly, I would tie the lures on, throw it out there for her, did it all day long, we would talk some, boy she loved it out there." David is sitting holding his long haired dachshund looking not at me but at the chair that still sits where his mother used to fish. "Time is special, kids don't appreciate that, I didn't when I was a kid, but I sure do now. Sometimes when I'm out on the water and I go by a spot that my daddy or pappa took me to as a kid I'll just sit there for 10, 15 or 20 minutes just looking at it and all the memories come storming back." There is a pause in both speech and petting the dog, "If I were to thank them, the main thing I would thank them for was the time they gave me, I know now how busy they were, know it because of how busy I was at there age, so for them to take time out for me, just tells me how much they must of loved me, how special it was for them to do that." This photo is one that David, and Sharon treasure, "My dad had Parkinson's when this photo was taken, he knew his time was limited, he came up to me out of the blue one day and said, 'son lets go fishing,' I was thrilled. Sharon walked him out on the dock, well it took some time for us to get him into the boat, that wasn't an issue was expected, we went for a 10 minute boat ride, I stopped and he made 3 or 4 casts from his seat, then put the rod and reel down. I asked him if he wanted to go back and he said 'nope I just want to sit here and watch you fish,' which he did for 30 to 40 minutes, but it was getting hot so we went back in. He told me (at this point David starts coughing and clearing his throat), he told me 'son you are a good fisherman,' and that was special to hear from him, then he said, and I'll never forget it, then he said this, 'I'm ready to go son, ready to go, this you know will be my last boat ride with you,' and it was." I stopped taking notes, it was the proper thing to do, so to was to just sit and wait for David to end this story, only proper once again for it to be David's words: "It's all about time db, TIME, fishing slows down time, gives you time to look around, collect yourself, see where you really are on this earth, but above all, it gives you time to be with the ones you love, not about the fish, it's about slowing down time." Sharon and David still fish often, " We call it fishing but we should really call it talking, We fish some but we talk more, we get away from the phones, from all the work and stuff we have to do and we just spend time together, I make a picnic lunch, we sit and eat and talk, sometimes we just sit and eat but you know what, just being together you don't have to be talking, just being together, fishing gives us that time, money can't buy that, no sir no amount of money can buy that." "I look forward to it, if we catch a fish that's fine, but it's not about catching, it's about taking the time out from a busy life just to be with one another, our pond, to me it's priceless, the kids come over they grab a rod and a reel, run down there, they spending time with family, you can hear them laughing and giggling, it's so wonderful to sit up here and listen to that, sometimes they catch something, other times not but they sound coming up from the pond is always the same, happiness." 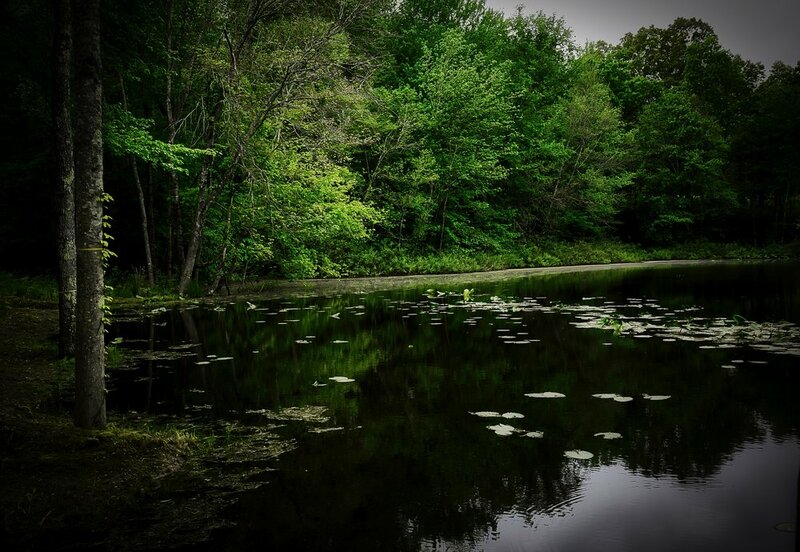 David is sitting across from Sharon, he's listening to her but looking at the pond, he is hearing the happiness float up, sound only he and Sharon can hear right now, to me the pond is silent. 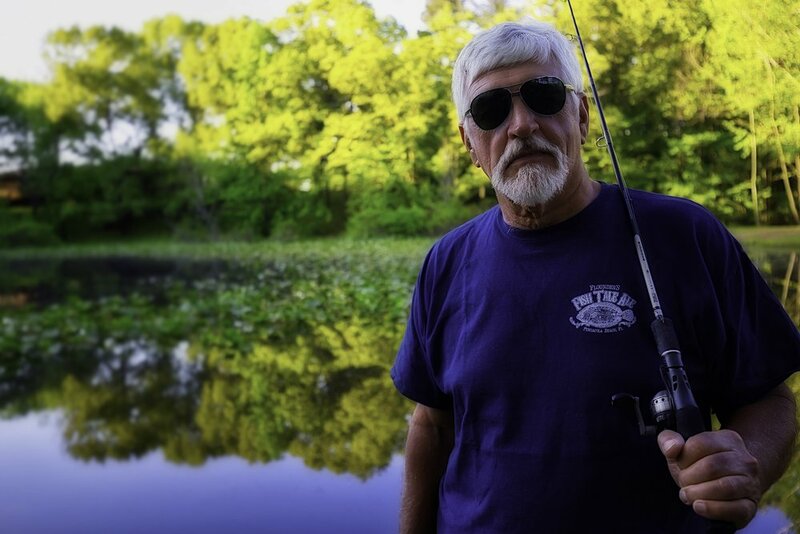 "db I'm almost 70 now, almost 70, it was a long time coming, time is now on the backend, you know what I mean, sometimes David and I we fish until dark, but it ain't about the fishing, it's about that backend of time. Fishing slows down time, slowed down time when we first met and he took me fishing that first time, slows down time now. Slows down time db, and you know what, thank God for that." If your 401K gave you a deposit option, stock it with extra money, or stock it with extra time, which would you take. I chose money, if you took time, I'll trade you, even up, dollars for days. No one told me until I was old that for the vast majority of people, anglers who fish from the bank, fish in the pond out back, the "crick" across the street it's not all about the fish, but more about the people, the loved ones you fish with, had they told me that when I was young my children, my wife would have had a rod and a reel in their hands a long time ago. It doesn't have to be all about speed and performance, that's fine for some, but for those like me where time is so closely monitored, where my time belongs to everyone else but me and my family, slow it down, SLOW IT DOWN. Big thanks to David & Sharon Seaton for being the willing guinea pigs for this first ever "fish with db, bb and riley too," page. Perfect pairing. ...we just missed named it as, a rod and a reel.